A mainly sunny sky. High 62F. Winds SW at 15 to 25 mph. Higher wind gusts possible..
Clear. Low around 30F. W winds at 10 to 15 mph, decreasing to less than 5 mph. There is a long list of things the rains brought this year. High on it is a smorgasbord of edible — and non-edible — mushrooms, and area hunters have had their fill for months. As the rains stop and the first frost approaches, that season is coming to an end. But there is still some bounty left for those willing to look. The best places to hunt edible mushrooms depend on what you’re looking to eat. There are a range of edible mushrooms throughout the area that ecologists refer to as the mixed conifer vegetation zone. That range includes pines, Douglas fir, spruce and aspen. Ponderosa forests have a number of common edibles like the iconic lobster mushroom and another local favorite, the Caesar’s Amanita. Other common favorites are barrow boletes and oyster mushrooms. If you have a trustworthy book to use as a source, it’s reasonably easy to pick out the mushroom you’re looking for. But mushroom identification is not something you want to get wrong, as Arizona Highways magazine learned this week when it mistakenly identified a psychotropic mushroom as edible and had to pull copies off store shelves. The perceived repercussions of getting it wrong keep many would-be foragers from eating forest foods. Noah Stalvey and his wife Debi started hunting mushrooms just a couple years ago and have already had scores many veteran hunters would envy. Last summer, they found 17 pounds worth of giant puffball mushrooms, including one massive mushroom bigger than a sack of potatoes. He says that he’s a hunter, but his wife is a vegetarian. Foraging for mushrooms is just about the only way they can both hunt for food together. This summer they pulled in 10 pounds worth of lobster mushrooms in one haul. Those same mushrooms sell for about $10 a pound at the Flagstaff Community Market. But some sellers at farmer’s market ensure their harvest is bug free by only pulling from the highest reaches of the San Francisco Peaks. Some of the more common ways to prepare wild mushrooms are in soups and stir-frys, or simply sautéed. The Stalveys like to dry what they won’t eat right away in a dehydrator and use them in dishes throughout the year. 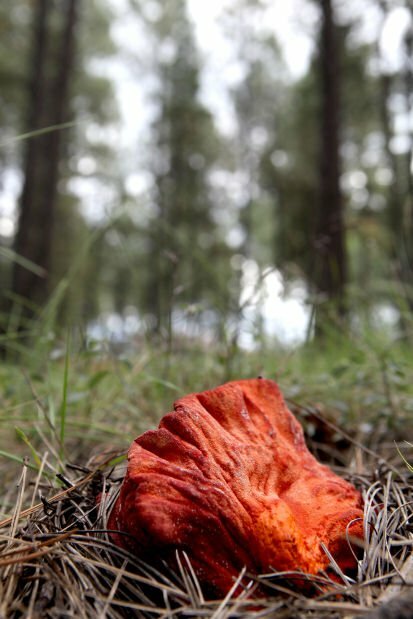 Lobster mushrooms are still prevalent in Flagstaff forests, but can often be infested with insects and worms. “The lobsters were everywhere this year,” said Flagstaff resident and mushroom hunter Kyle Hartley. The U.S. Forest Service does not require any special permit to collect mushrooms. The Stalveys say they also stick to the Peaks for mushroom finding. But they’ll never reveal their best spots. In the mushroom hunting world, people won’t hesitate to tell a newcomer they’re on their foraging turf. “All That the Rain Promises and More” by David Arora is a popular book for mushroom identification and can be bought online or ordered in local shops. 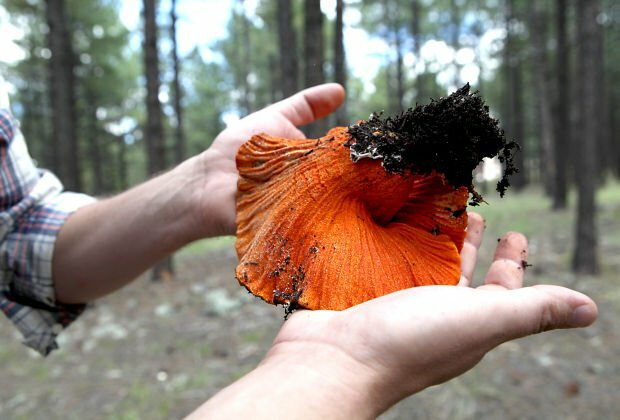 Another resource is a website by NAU graduate student and avid mushroom hunter Erik Nelson, Arizona Mushroom Primer. It’s at http://www.tanelorn.us/data/mycology/myc_index.htm. Eric Betz can be reached at 556-2250 or ebetz@azdailysun.com.